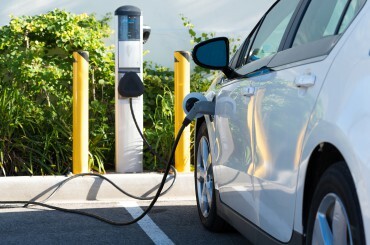 Offering zero CO2 emissions, electric vehicles offer a sustainable, credible and now widely available alternative for a wide range of vehicle types. PwC forecasts that global production will more than triple between now and 2020, and the development of charging infrastructures is key to making this boom a reality. Rexel contributes by offering safe, efficient charging solutions suitable for public-sector, private-sector, business and personal applications. 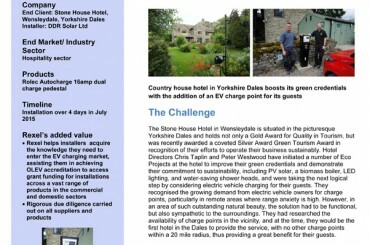 To implement their sustainable development engagement, the owners of the Stone House relied on Rexel to install a charging station at their hotel. In Canada, Nedco, a Rexel subsidiary and country leader in electric vehicle charging stations, uses Eeko Couriers 100% hybrid fleet to reduce greenhouse gas emissions. In exchange, Eeko Couriers has free access to Nedco’s charging stations.